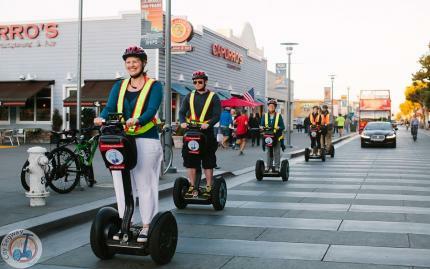 The smell of Sourdough bread will follow you as you glide on your Segway to experience new parts of San Francisco. 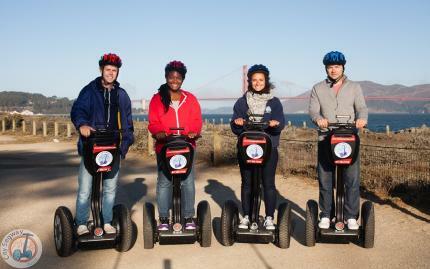 This tour will teach you how to use a Segway and let you enjoy it in the best parts of the city. You will see Fisherman's Wharf, Alcatraz, Municipal Pier, Golden Gate Bridge, Ghirardelli Square, Aquatic Park, Cable Car Turnaround and the USS Pampanito Submarine. From tempting restaurants serving crab to a 1943 submarine, the tour will create memories that will last. Note: You must weigh between 100 and 260 lbs and be at least 12 years old to participate. Additionally, pregnant women are not permitted on this tour. Minors under the age of 18 must be accompanied by a parent or legal guardian. Tour operates in rain or shine. Ponchos are available to purchase from the tour office in case of rain. Cancellations must be received 72 hours in advance for a full refund.